Itemis-ccg-2889 - Paving 11th Avenue, to 1st Street West, Calgary, Alberta. Itemis-ccg-3639 - Looking north from the roof of the Victoria Park powerhouse. Itemis-ccg-3739 - Lightning damage to ring main pole. Itemis-ccg-2890 - Paving 11th Avenue looking west, Calgary, Alberta. Itemis-ccg-3640 - Stores area of the Victoria Park powerplant. Calgary's frontier streets were lit by candle and gas lamps until 1887 when Calgary Electric Lighting Company Limited opened the first electrical power generating plant in Calgary. 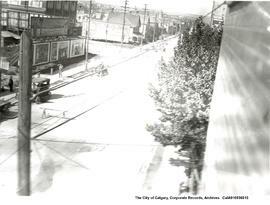 Calgary's citizens were offered shares in the new company located (by present day description) half way between Center Street and 1st W on the south side of 7th Avenue, just east of Central United Church. The town of Calgary was one of the Company's first customers who ordered ten, 32 candlepower lights that stayed lit until 4:00 a.m. each day at a monthly cost of $5.00 per lamp. It is difficult to confirm where these first streetlights were located, but it is believed that they were on current-day Atlantic, Stephen, and McIntyre Avenues between Scarth and Drinkwater Streets. In November 1889 Calgary Electric Lighting Company Limited was challenged by the services of a new electrical supplier, Calgary Water Power Company Limited, owned by Peter Prince. For a number of years, aggressive competition between the two companies existed as they fought to offer the best electric contracts to The City. In 1893 Calgary Electric Lighting Company bowed to the pressure of competition and Calgary Water Power Company became the sole supplier of electricity for Calgary's public and private needs. City officials soon realized the value of having a municipally owned power plant, and with the support of citizen petitions, brought the issue before Council. On November 24, 1904, City Council gave first and second readings to Bylaw 562 that authorized The City to raise $60,000 for an electric light plant. One year later, the Atlantic Avenue Power Plant opened on the northeast corner of 9th Avenue and 5th Street West. Employees of the new steam power plant worked overlapping shifts so that the power plant could provide twenty-four hour electric service. The first city Electrician, Lionel White, managed the construction of the municipal power plant, while James McCall assumed responsibility as Chief Engineer and Superintendent. In 1905 The City assumed sole responsibility for streetlighting and by December, eighty new current arc lamps with 1,200 candlepower were in operation. For more information regarding the City of Calgary Electric System administrative history, please link to the City of Calgary Archives homepage and click on the "fonds level descriptions" link. The fonds consists of textual records, graphic records and sound recordings from 1884 to 1997 that reflect the administrative and operational history of The City of Calgary Electric System. The textual records include minutes, reports, ledgers, publications, newspaper articles, press clippings, public relations correspondence, Burton Commission reports, substation inspection and entry logbooks, network distribution maps, and Employee Record cards dating 1910 to 1969. The graphic records in this fonds include photoprints and negatives of employee events and staff retirement functions, substation and power plant construction, and daily operational activities such as streetlighting and electrical wiring repairs and the installation of underground electrical distribution by Electric System employees. Sound recordings include videotapes on staff training and orientation and cassette tapes of radio advertisements. Records have been arranged into the following series; Series I: History and Annual Reports; Series II: Public Relations; Series III: Operational Records and Reports; Series IV: Log Books and Ledgers; Series V: Employee Records; Series VI: Maps and Plans; Series VII: Photographs. Includes: 12,000 graphic images, 1000 microfiche, 300 plans/drawings, 20 audiotapes microfilm, 3 Beta U-Matic videotapes, 3 VHS videotapes, 4 artifacts. The records of the City of Calgary Electric System were held by the City of Calgary Electric System Library and Archives which was transferred in 1997 to its successor ENMAX. Many of the records were catalogued and it is unknown how other records were acquired by the Electric System Library; however, acquisitions likely occurred through unscheduled transfers directly from the various sections and divisions of the Electric System. It may be possible that records were housed at the Glenbow Archives during this time. Between 1983-1996 The City of Calgary Archives received a number of unscheduled accessions from various departments within the Electric System. In 2001, in accordance with the ENMAX Master Agreement with The City, Electric System records housed at ENMAX were appraised and a selection was repatriated by the City of Calgary Archives (see accession 2001-004). Further accruals of records created by The City of Calgary Electric System may be received by the City of Calgary Archives as a result of private donation or the records management program underway at ENMAX.